It’s Fill in the Blank Friday! My favorite July 4th Tradition is __________. Post your comment here, on Facebook or Twitter! I know many will be cooking out, watching fireworks and spending time with family! Will you be wearing the traditional red, white and blue? Here are some ideas to accessorize for the 4th! 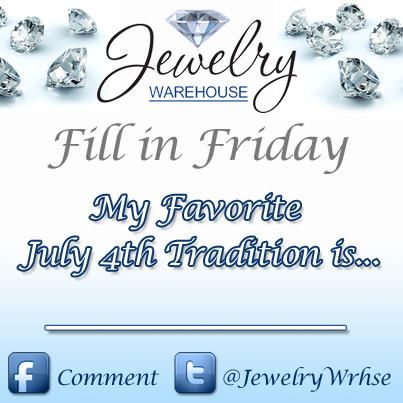 This entry was posted in Fill in the Blank Friday and tagged 4th of july, 4th of july ideas, blue, jewelry warehouse, red, usa, white. Bookmark the permalink.